Price: $58950 - Unmolested and original, NCRS ready! It is not often that we come across a gem like this: a documented, original, unmolested time capsule which retains the authentic look of the era, all the while being in excellent mechanical and cosmetic condition. Our offer today is a very special 1965 Coupe, two family owned since new, mostly in California. It has only one re-spray in the factory Milano Maroon and has an original no-hit body. Needless to say, all numbers are matching with the exception of the starter. The tires are Firestone Deluxe Champion gold wall, size 7:75-15 mounted on aftermarket Western cast aluminum Knock-Off wheels, all in very good condition. The following comes from a recent inspection by NCRS member: "MECHANICAL: The engine started quickly and idled smoothly. We found that the transmission shifts extremely well. The brakes stop the car with no pull to left or right. The steering is easy and tracks straight down the road with no vibrations. The gauges all work properly and the new mufflers have a nice rumble. EXTERIOR: The exterior physical condition of this vehicle’s fiberglass is excellent with no stress cracks around the car. All the body panels are original and align nicely. The doors open and close solidly with no sagging. The re-paint and chrome are almost perfect. We did note the tape lines in the door jams from the re-spray. INTERIOR: The original vinyl and carpets are in very good condition, with no rips, tears or holes noted. The new leather seats are excellent. The door panels, kick panels and rear panels are also very good. The headliner is not sagging with just some of the color coming off over the drivers and passenger’s heads. The dash, dash pad and gauges are all excellent and worked as intended. The chrome and knobs are very good. There is a minor paint issue with the color-coded seat belts. ENGINE COMPARTMENT: The engine and engine compartment is mostly clean and original. The chrome distributor cover and spark plug covers are still installed. 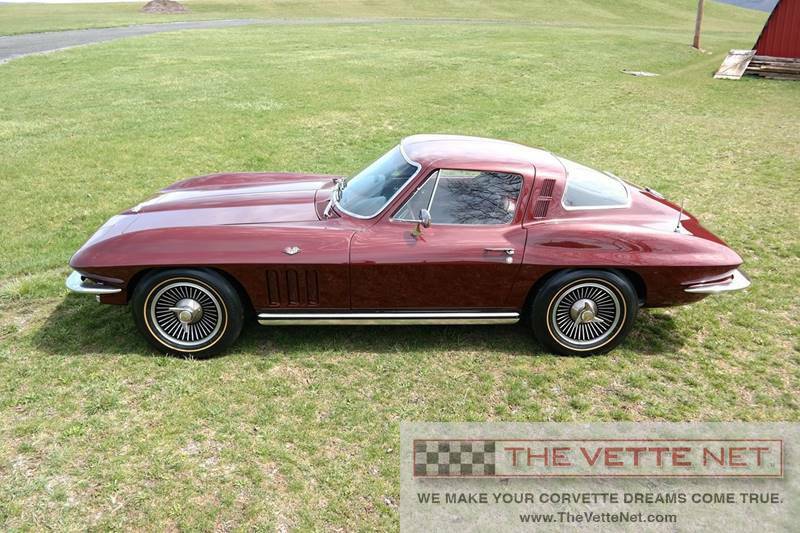 This 1965 Chevrolet Corvette coupe is in very good condition with no modifications. It also has some receipts, original window sticker and NCRS registration. OVERALL CONDITION CODE: #2, "VERY GOOD"
Located in GEORGIA, we can arrange delivery nationwide and all over the world. Corvette trades are considered, also, financing is available.